It is recommended that individuals drink about 500 ml of fluid about 2h before exercise to promote adequate hydration and allow time for excretion of excess ingested water. During exercise, athletes should start drinking early and at regular intervals in an attempt to consume fluids at a rate sufficient to replace all the water lost through sweating, or consume the maximal amount that can be tolerated. During exercise lasting less than 1 h, there is little evidence of physiological or physical performance differences between consuming a carbohydrate-electrolyte drink and plain water. Inclusion of sodium (0.5-0.7 g per liter of water) in the rehydration solution ingested during exercise lasting longer than 1 h is recommended since it may be advantageous in enhancing palatability, promoting fluid retention, and possibly preventing hyponatremia in certain individuals who drink excessive quantities of fluid. There is little physiological basis for the presence of sodium in an oral rehydration solution for enhancing intestinal water absorption as long as sodium is sufficiently available from the previous meal. From the American College of Sports Medicine (1996) Position stand on exercise and fluid replacement. Medicine and Science in Sports and Exercise 28: i-vii. awareness of the importance of proper hydration. The American College of Sports Medicine has issued a set of guidelines for fluid replacement (Table 6). Simple methods, such as recording body weight before and after exercise to determine fluid loss and observing the color of urine or the turgidity of skin, can be useful for monitoring hydration status. The simplest insurance against dehydration is to consume fluids prior to and during physical activity or heat exposure to match water loss. The amount of fluid needed to maintain a favorable hydration status is variable between individuals but often necessitates drinking in the absence of thirst. Excess fluid consumption is rarely a problem. However, caution should be used to avoid dilutional hyponatraemia from overzealous hydration. Humans can acclimate to work in a hot environment and enhance their ability to thermo-regulate and conserve fluid, but they cannot adapt to dehydration. Acute dehydration can decrease physical performance and thermoregulation ability and increase the risk for heat illness. 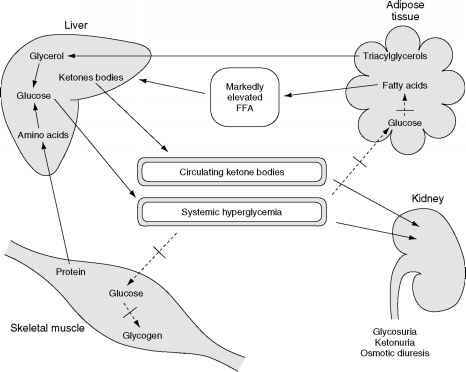 Chronic dehydration can reduce metabolic and thermore-gulatory efficiency and increase predisposition to kidney disease. The deleterious effects of dehydration on physiological function are summarized in Figure 6.